Chinese earth land resources satellite. Operational, launched from 2002.05.15 (Hai Yang 1). 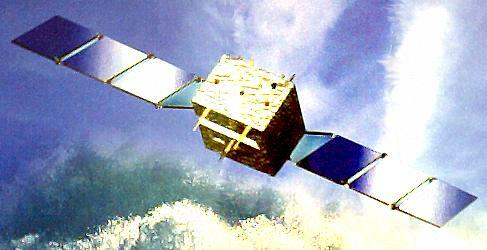 Oceanograpy satellite built by DFH Satellite Co. Ltd of CAST for CAST, China. Launched 2002 - 2007. Used CAST968B Bus. AKA: Haiyang. Status: Operational 2002. First Launch: 2002-05-15. Last Launch: 2007-04-11. Number: 2 . Gross mass: 340 kg (740 lb). Height: 5.80 m (19.00 ft). Diameter: 0.76 m (2.50 ft). Span: 2.41 m (7.90 ft). The Haiyang-1 (HY-1 or Ocean-1) satellite was equipped with a 10-band IR ocean color scanner and a 4-band CCD camera and was designed to end China's reliance on foreign satellites for marine observation. A total of five HY-1's were planned, with one launch every other year through 2010. 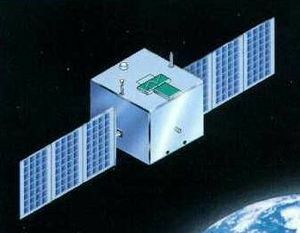 The Chinese Academy of Space Technology (CAST) announced on 11 August 1998 that it was developing a small satellite bus (CAST968) for science and earth observation missions. The first two satellites based on this bus were to be the Shijian-5 (SJ-5) and Haiyang-1 (HY-1 or Ocean-1). Both satellites would weigh 340 kg and had two solar panels. HY-1 was to be equipped with a 10-band IR ocean color scanner and a 4-band CCD camera. HY-1 completed a major design review in July 1999 and an electronic test model of the spacecraft was delivered in late 1999. In October 2000 China announced that the HY-1 would launch during 2001. China's National Ocean Administration was to build two ground stations for HY-1: one in Sanya, Hainan Island, the other near Beijing. Family: Earth, Earth land resource sat. Country: China. Launch Vehicles: Chang Zheng 2C, Chang Zheng 4B. Launch Sites: Taiyuan, Taiyuan LC1. Agency: CAST. Bibliography: 2, 424, 552, 554, 6574, 12625.